12 ft x 30 ft with an 8 ft covered deck. 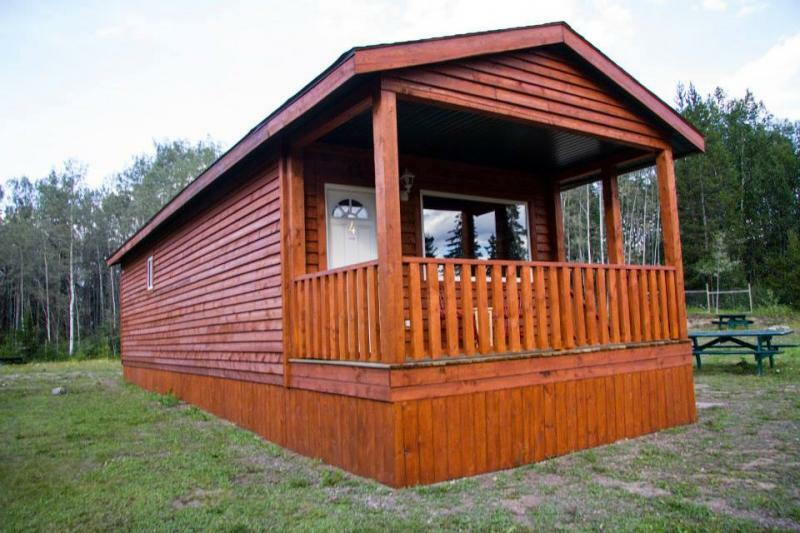 Self-contained cabin with a small kitchenette and washroom with shower. Towels and bed linens are provided. Pets are welcome for additional charge. Set up for 1 person or a couple in 1 Queen Bed. Features.. Dresser, love seat, Vintage 50's chrome table, and 2 chrome chairs. Same kitchen/bathroom set up as #1, and all linens, towels, utilities, free wifi, NEW 32" FLAT SCREEN TV, Shaw TV included. Stocked kitchen with pots, pans, dishes, coffee maker, microwave, toaster oven, etc. This cabin will sleep 2 people - Queen bed. The kitchen is supplied with dishes, pots & pans, microwave, toaster oven, under-counter fridge, coffee pot, teapot, toaster, cutlery, etc. and a new loveseat. Look here for more info and photos. Our deluxe Sports Hockey Fan Cabin. 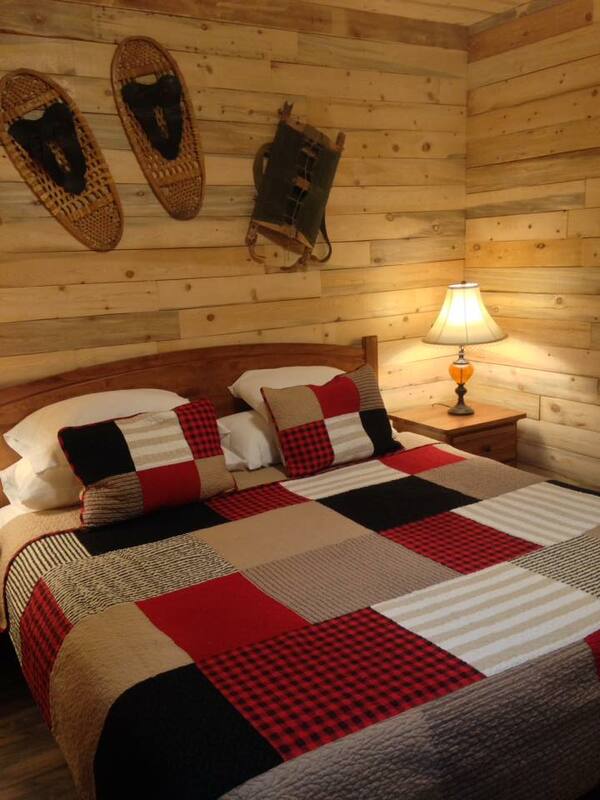 Hockey prints, skates on wall, snowboards and snowshoes, large HD TV screen. Click here for more information & photos. Sleeps up to 6. 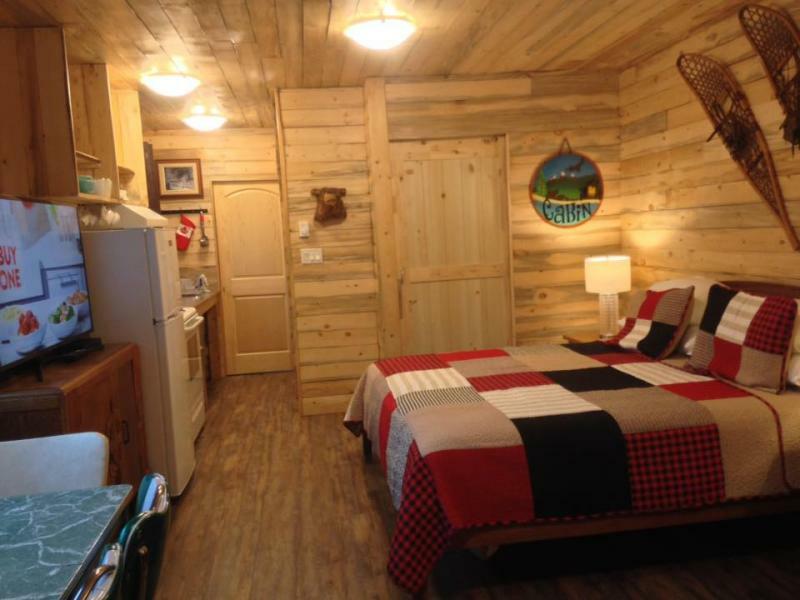 2 queen beds, 1 in the living room, 1 in the bedroom with log bunk bed set. 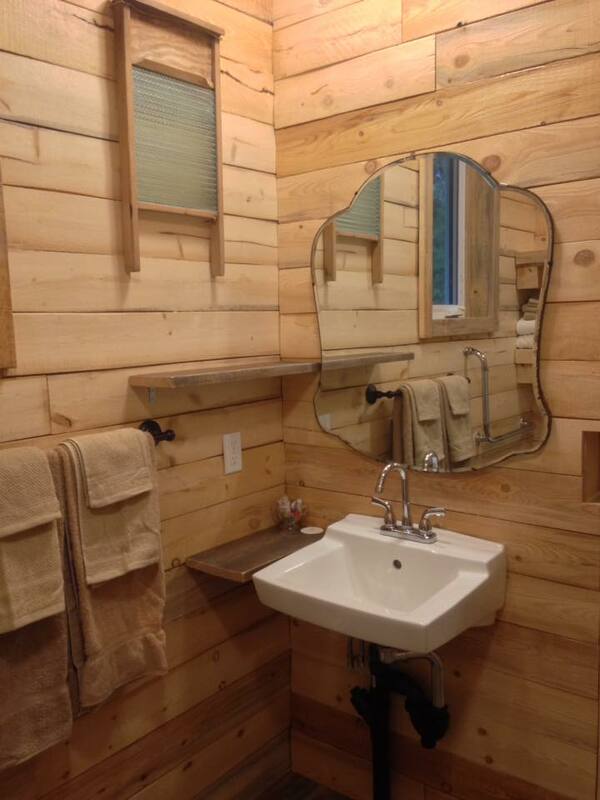 Bathroom with Large shower stall, Vintage chrome table with seating for 6, large flat screen tv. Best view of the Hudson Bay Mountain and Glacier from the covered deck. Steelhead Salmon (reproduction by Chuck Holyk - Headwaters Fish Reproductions) behind vintage window display with vintage lures, rods, and reels. They both have a private fenced yard and a private driveway. Queen beds in separate rooms with the Twin bed in a hall room. Larger kitchens with stove/oven, fridge, fully stocked with pots, pans, coffee maker, dishes, bakeware, etc. Large fenced grassed yard with an entry door in the hallway out to a mid-size landing area. Sleeps up to 5 people in 3 beds. All new flooring, new sofa, and a Country theme add charm to this favourite Cottage. Sleeps 4 people - 2 beds, 1 Queen in the living room and Double in the back bedroom. Private driveway and small fenced yard. Enjoy the nature right outside the window. Fully stocked kitchen with full-size fridge & stove. Washer/dryer. 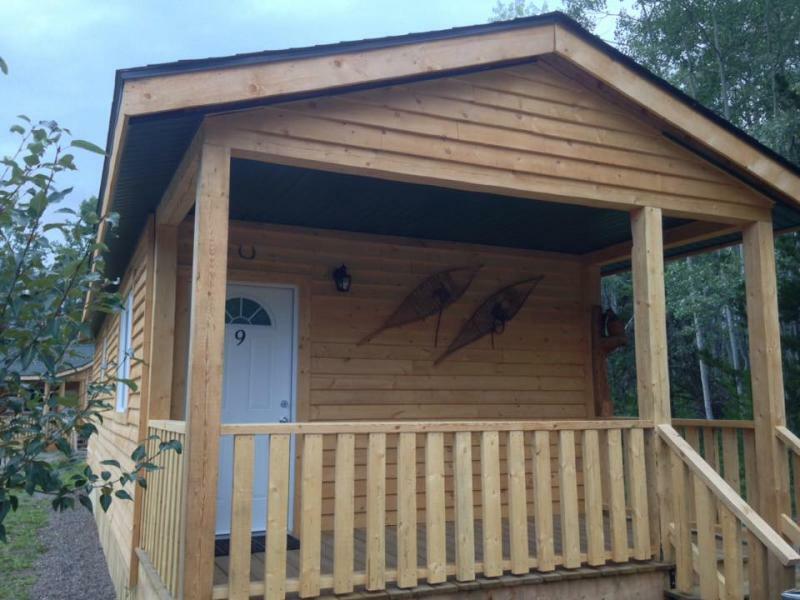 self-contained with running water, electric power & heat, stocked kitchens, coffee pot, beds with linens, bathroom with shower, TV, towels, WIFI included, etc. King size bed, large handicap accessible Shower, Fridge & Stove, large TV, Spacious, couch, large covered deck, etc. Cottages 5 & 6 are located on the Nouch Frontage Road right beside campground entrance, giving them a private driveway. $50 per bed Incidental cost will occur for using more beds than requested at Check In. 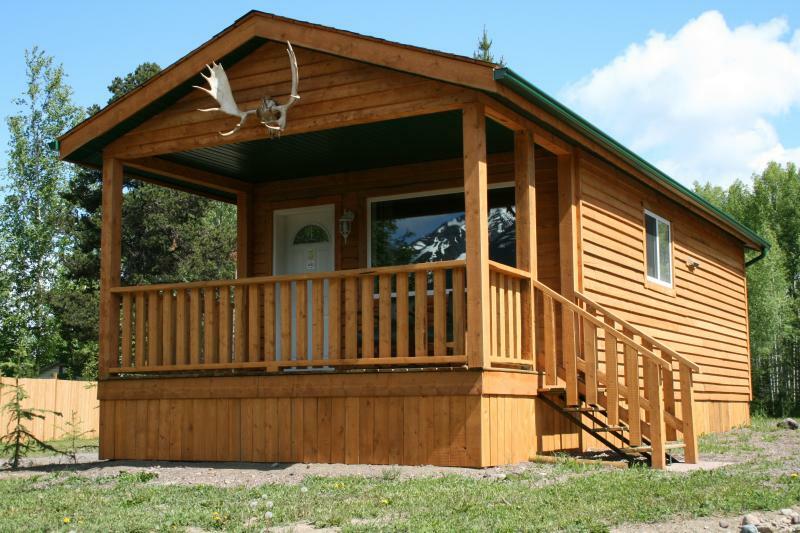 Pets are allowed upon approval in Cabins 1-4 and Cottages 5 & 6 at the rate of $10-$15 each per night. ALL Prices plus taxes and subject to change. 5% GST & 8% PST for all Cabin/Cottage Rates.